08/12/15 UPDATE: This Workshop Grant with the Singapore Heritage Society has been awarded to independent filmmaker Clarice Lee for her project “FIRST WORLD UBIN” on Pulau Ubin island, off the north eastern coast of Singapore. 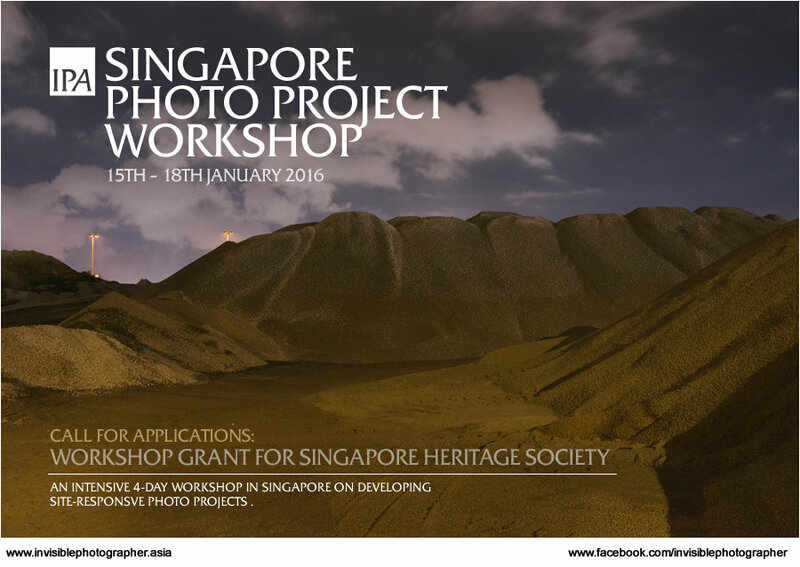 Invisible Photographer Asia (IPA) and Singapore Heritage Society are offering 1 Grant to participate in the Singapore Photo Project Workshop happening over 4 Days from 15th – 18th January 2016. The Singapore Photo Project Workshop is an intensive 4 day course for beginner to intermediate level participants who wish to develop photo projects and narratives in Singapore. The workshop will encourage investigation and interpretation of history (local or national, private or public), topography, community and locality to author creative site-responsive projects using photography as a medium. Participants may choose to work on a place or neighbourhood in Singapore of personal significance, or a site of national heritage or historical interest. Research material, be they family or public archives, text, drawings and photographs, serve as raw ingredients to meditate and author the individual responses. The workshop will be mentored by Kevin WY Lee, founder of Invisible Photographer Asia, with a guest lecture by Li Li Chung, founder of Exactly Foundation, Singapore. This Grant offers free participation in the workshop with fees waived. Provide a brief outline proposal of the site you would like to work on during the workshop. APPLICATION DEADLINE: TUESDAY, 1ST DECEMBER 2015. Applications will be shortlisted by Singapore Heritage Society. The winning applicant will be selected by Invisible Photographer Asia and contacted with further participation details. Founded in 1987, the Singapore Heritage Society is a non-profit, non-governmental organisation and registered charity with Institution of Public Character (IPC) status. As independent voice on heritage issues in Singapore, it is dedicated to research, education and advocacy relating to Singapore’s history, culture and and identity. Run by volunteers, the Society’s active members include academics and professionals in related industries as well as serious enthusiasts from all walks of life.